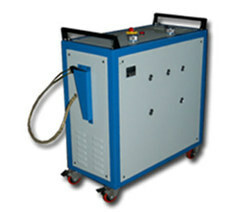 We are a leading Manufacturer of spindle lubricating machine from Gandhinagar, India. Flushing Gun : Fitted with S.S. Nozzle assembly, which cleans the bolster from neck bearing to footstep bearing and the dirty oil will be sucked out efficiently which go to the flushing oil tank duly filtered twice by micro filter. 3 Tank: Three separate oil tanks provided for flushing tank 20 ltrs., Lubricating and Topping tank 12 ltrs. Capacity each. Due to zero leakage, no oiliness around the bolster which also ensures no fly and flu faccumulation, thus keeping the spindle / Ring frame neat and clean too. Proper cleaning helps extend lubrication frequency. Flushing oil is filtered by using micro filters and re-use minimizes oil wastage. Auto leveling system help to maintain perfect level of oil in Spindle bolsters thus bringing about power cost saving in Ring Frames. Long life gear pumps ensure excellent suction performance and robust reliability in service. Reduced consumption of expensive lubricants. No oil Spillage.